Publisher and resident retronaut's best friend DotEmu has announced it will be bringing the Double Dragon Trilogy to iPhone, iPad and Android devices sometime "soon". That's great news and all, but the cool part is it will support two player local co-op play via Bluetooth! The Double Dragon Trilogy compilation will include Double Dragon, Double Dragon 2: The Revenge, and Double Dragon 3: The Rosetta Stone, all packaged together with reworked controls and virtual touchscreen buttons. Other modern features include three levels of difficulty (we'll only be using Expert, thank you very much), leaderboards, achievements, Bluetooth controller support, an optional remixed soundtrack, and our favorite... local co-op for two players! DotEmu has released some fine retro ports these last few years, including, of all things an iOS version of Samurai Shodown II. The team is meticulous when it comes to preserving the original games, but since portable touchscreens aren't quite as sturdy as arcade cabinets, some tweaks are made to accommodate the shift. 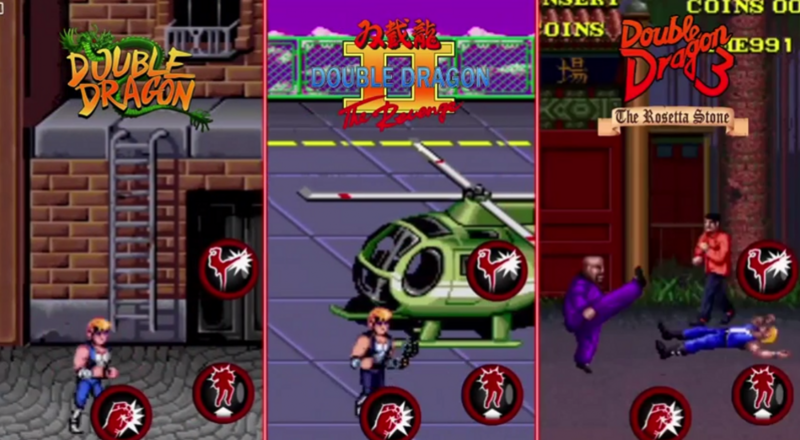 With the Double Dragon Trilogy, for example, players can choose a special "mobile" difficulty that balances the game for portable devices. The granddaddy of all beat-em-ups is listed as "coming soon" by DotEmu. It will support local Bluetooth play for iOS and Android devices. Page created in 0.9430 seconds.